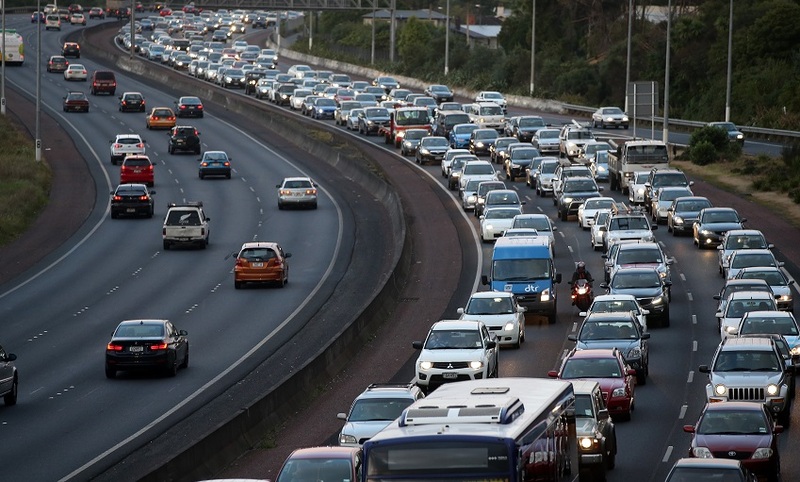 It’s official: Auckland is the most congested city in Australasia, according to Uber. It hired international management consultancy Boston Consulting Group to look at transport in the region’s major cities and what role ridesharing services such as Uber will play in the future. Turns out Auckland’s rush hour traffic is even worse than Sydney’s, and is significantly worse than in Perth, Adelaide, Brisbane and Melbourne. Travelling at the Perth peak will take you 32% longer than at other times, but in Auckland it’ll take almost 50% longer. It will surprise no-one to learn that Aucklanders love their cars. Private vehicles account for 90% of the total passenger kilometres travelled on our largest city’s roads, the report says. Despite the public transport system coming on in leaps and bounds in recent years, only 5% of Aucklanders’ travelling is done on buses and trains (this compares with 23% in Sydney). Auckland is second only to Perth in the car ownership stakes. Just 8% of Auckland households are carless, and over half have more than one vehicle sitting in the garage. Those second vehicles do not pull their weight – the average occupancy of the additional family car is 30% less than the first one. Despite New Zealand and Australia leading the world in regulating the rideshare or ‘point-to-point’ transport market, private cars still dominate the urban landscape, Boston Consulting says. It’s partly to do with the low population density in Australasian cities, our high average incomes relative to the cost of cars, and our out-and-out preference for riding around in our own personal pieces of steel. It’s also not helped by limited access to public transport. Governments on both sides of the Tasman have put a lot of money into public transport in recent years, but still only 35% of homes in Australia’s major centres are within 400 metres of a service that arrives at least every 30 minutes. Boston Consulting doesn’t give a comparable New Zealand figure but it’s hard to imagine it would be any better. It highlights the need for a different approach in how we operate and regulate our cities’ transport systems, Boston Consulting says. Given its report was paid for by Uber it was hardly going to reach any other conclusion, but ride-sharing could be part of the answer, the consultants say. The introduction of pooling trips on rideshare services to increase occupancy – Taxis have been doing it for a long time but without a technology platform. Destination targeting for rideshare drivers to promote carpooling – The driver selects the area they want to drive to and is matched only with trips heading in that direction, thus reducing kilometres travelled and potentially the number of cars on the road. Multimodality – Integrating ridesharing and public transport networks to extend a city’s public transport spine. Micromobility – We’re talking Lime scooters and their ilk, and as controversial as they’ve been, there is no sign of e-scooters leaving Kiwi streets anytime soon. Lime Scooters gained a rival with the official launch of Wave this week. On-demand public transport – Leverages the technology used in ridesharing to match and pool passengers. “A robust network of urban mobility options has the potential to lead to more consumers choosing to forgo private car ownership and opting for shared modes of transport instead,” Boston says. New Zealand and Australia’s level playing field approach to ridesharing transport reform could yet produce more benefits, the report concludes. *This article first ran on The Spinoff here and is used with permission. Maria Slade is The Spinoff's Business Editor. Auckland Council public transport is pretty centralised and investing billions in making it more so, everything from the CRL to light rail to cycle lanes. Therefore the utter morons at Auckland Council have decided to make growth multi-nodal and dispersed. Because spending billions at cross purposes is the Auckland way, people have to drive.